Gertie was not-so-tragically addicted to M&Ms at the end. She passed peacefully in her sleep, as is so often said about the death of beloved elderly and which must, sometimes at least, be true. The news was expected-yet-shocking. ‘Gertie scares’ were common in the last half decade, Beth dropping everything to rush out to Danielson House when things looked dire, but Gertie simply had a knack for living longer than anyone expected. After a series of false alarms, the drill was almost routine. Finally, though, the melancholy call came, and this time Gertie’s health hadn’t been crying wolf. Just five days shy of her 100th birthday, Gertie was gone. Beth found herself crammed into her father’s Mercedes with black-clad, teary-eyed family the very next day. We sure like to get ‘em in the ground fast, she thought. Expulsed from the car onto the sidewalk, they were greeted by a caricature of a funeral home director — thin, pale-faced, vampiric. He offered some muted tones to Beth’s father, who nodded a few times, smiling soberly. The director herded them into the foyer, where an assortment of snacks and drinks had been arranged. A comically oversized bowl of chopped liver dominated the table, an homage. Who’s gonna eat all this? thought Beth. No one actually liked the stuff except for Gertie. An image flashed: Gertie demolishing a humongous bowl at Thanksgiving, singlehandedly, a glop resting in the corner of her mouth as she chewed, giggling excitedly with no one and everyone. Beth watched herself spread some chopped liver on a cracker. She took a cautious bite. Yup, she thought. Still hate it. The powder-blue parlor was staged with rows of empty chairs, giving Beth the immediate apprehension that no one was going to show up. In life, Gertie could be a terror, and she didn’t spoil the grandkids. How furious Beth had been the time Gertie made her get out on the shoulder of Route 128 to run laps around her Olds, one of her novel punishments. She’d stop anywhere, back road or highway, made no difference. So totally dangerous, chuckled Beth. A modest brown coffin presided over the room, closed, in which Gertie ostensibly lay, smiling a pleasant smile from that oh-so-peaceful passing. I should label this, thought Beth. She traced a finger along the edge of the coffin. A secret tribute! Gertie was a chronic labeler, an obsessive-compulsive before the mental illness had a moniker. She would scrawl name, date and description and slap the tape on the back of anything and everything she owned, which was useful for dating food or photos, but could be overkill when she dated, say, the calendar. I wonder how she would label her own coffin? thought Beth. 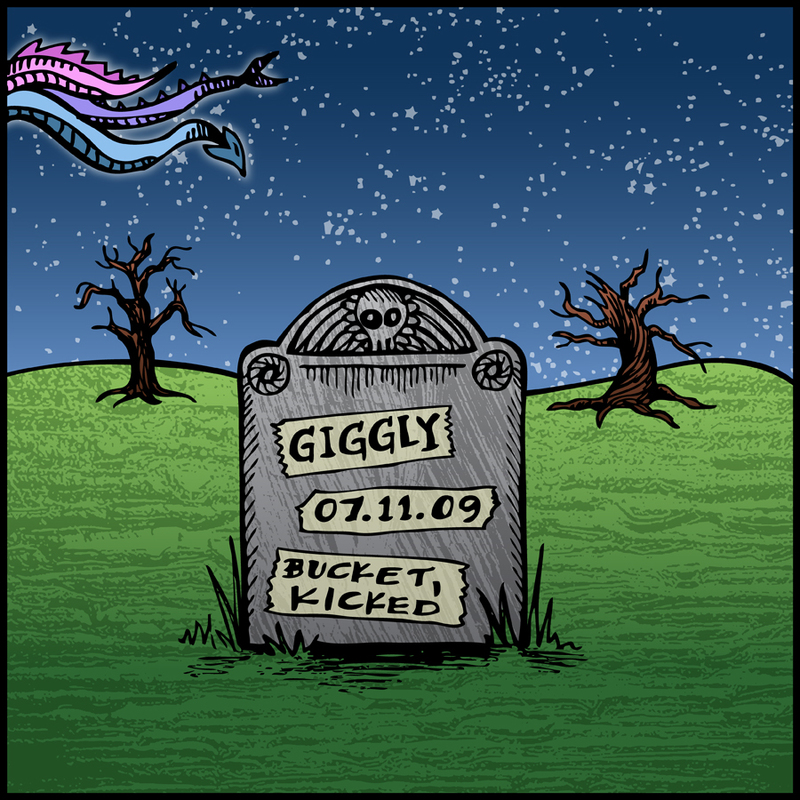 Probably something like ‘GIGGLY/July 8, 2011/BUCKET, KICKED’. She entertained the notion for a moment, but realized she didn’t have the nerve. Oh well, thought Beth, I guess that’s what the gravestone is for. It’s the final name, date and description. For a time, the parlor remained stubbornly empty, the family chewing absently on snacks in awkward silence. Alzheimer’s and old age had softened Gertie’s sharper edges, and she had a lot of friends at the nursing home, or so Beth had thought. Mercifully, a procession of creaky, bowtied men and plump, purple-haired matrons began trickling in, shuffling or rolling to their seats. One old crone made a fuss in the foyer, barking at the funeral director. “No, no, no!” she insisted, “This is for Franky. Franky Mostiler! You’re not hearing me, son. Franky Mostiler.” When the director finally convinced her she was in error, she shrugged and sat down anyway. Beth could feel the molecules in the room shift as the chairs filled up, somber silence banished in favor of cheerful chatter. If Gertie was here, thought Beth, she’d probably be asking these people who the hell they are! Gertie had the ‘good Alzheimers,’ if you could call it that, her confusion filtered through a chipper personality. The illness would unveil itself at family functions when she’d ask friends and family alike a standard line of questioning. The continuous loop went something like: [1. What’s your name? 2. Where are you from? 3. Where do you work? 4. Are you married? 5. How old are you? 6. How much do you weigh?]. A drunken boyfriend Beth had brought to dinner once answered: [1. Sir Isaac Newton. 2. The Land of the Oompa-Loompas 3. NASA 4. Yes, to the Lord 5. Seven 6. Four hundred stone]. Not everyone at the table was amused. The funeral director let out a whimper, disappearing down a flight of stairs. Beth marveled at the wiry creature’s strength as he returned with an armload of extra chairs. She imagined him pulling them from a dusty corner in the basement, where they had been stacked against his sarcophagus. Amy finally appeared, dragging Max and Otis behind her. They were clutching toys that had probably only been allowed after an epic battle of wills, which the boys had won. Amy looked up, letting out an audible sigh of relief. “Amy…” said Beth, enveloping her. “Nope!” said Beth. Amy spread some of the brownish stuff on a cracker and took an exaggerated bite. She tilted her head, giving Beth a look as if to say mmmm, so good! Beth smiled. “To Gertie,” she said, lifting her cracker. “To Gertie,” said Amy, raising hers. “I guess it’s not so bad,” said Beth. “Yeah,” said Amy. “It’s really not that bad at all.” A small glop of chopped liver came to rest in the corner of her mouth as she chewed. The boys extracted themselves from the snack table, where a plate of chocolate macaroons now held them in thrall, the recently-prized pterodactyl abandoned. They hugged Beth’s legs. “Hi, Aunt Beth!” the boys said in conditioned unison before darting back to their chocolate macaroon master. Amy flipped her thumb in the direction of New Jersey. “Anthony gave Max one of those remote-controlled helicopters for his birthday, and he’s obsessed with it,” she said. Elise limped over and gave Amy a hug, squeezing hard with her good hand. She had suffered countless seizures as a child and her doctors, out of options, needed to remove a large portion of her brain. The operation left Elise partially disabled, but with more personality and force of will. She was a killer in the Reading Community Singers and a regular on any Disney Cruise, provided that it was princess-themed. “That sounds awesome,” said Amy. The family made their way to the front row for the service. A fat-cheeked, jocular rabbi took them through prayers and non-denominational inspirations, speaking generically about Gertie and what she meant to family and friends. Of course, he left out certain details, like how when you talked to Gertie, she would ask you to talk into her ‘good ear,’ but the ‘good ear’ would switch depending on whether she felt like dealing with you or not. The service was charming, but Beth found her attention drifting. Another image flash: The time Gertie held the Country Bear Jamboree hostage. “We’re not moving!” she had screamed at the usher, who was trying to shift them back a row to make room for people filtering in. “We were first in line!” Amy and Beth had been mortified. “This isn’t Russia, you know!” The pimple-faced usher was at a loss. “It ain’t New York city, either, lady,” a man had leaned forward to offer. Beth’s smile faded when she was startled back to attention by the rabbi. “I’d like to invite the Green family up to say a few words about Gertie,” he said. Oh, boy, thought Beth. Her pulse fluttered as she trailed her family to the front. I’ll pass? she admonished herself as the family returned to their seats, but no one seemed to mind. Elise shuffled in front of the coffin, pulling a scrap of notebook paper from her pocket with her good hand. “I have scales!” shouted Otis. Amy placed a hand on her son’s knee and squeezed. “Aunt Elise!” exclaimed Otis, apparently noticing her for the first time. He waved enthusiastically. “I’m happy!” yelled Otis. Beth heard several octogenarians chuckling in the back row. “I have shawp teef!” said Otis. “Otis, shush,” said Amy, tapping him on the knee. Elise doubled over, bursting into laughter. “Otis, you so crayzay!” she choked. A line of drool began stretching its way from her mouth to the ground. Her father whipped a Dunkin’ Donuts napkin from his pocket and intercepted it, tracing it back to her mouth. Beth shifted uncomfortably in her seat. Uh, oh, she thought. At Passover Seder, a different drunken boyfriend had made Elise laugh so hard that she had projectile-vomited all over the table. Not here! thought Beth. Beth could see Max wiggling. “Mommy, look!” said Max. “I’m gonna make the dinosaur disappear!” He placed the pterodactyl under his chair. “Now it’s gone!” he announced. The rabbi, who had been standing off to the side politely, looked up. “Can I go to the bathroom?” whimpered Max, his eyes blinking with unblemished innocence. Max wriggled, squeezing his crotch. “No I really need to go to the bathroom I really need to go now,” he said. Uh oh, thought Beth, He’s gonna start stompin’. “Ok, ok,” said Amy. “It’s over there. Go quickly and come right back.” Max pushed passed several wheelchairs and heads of purple hair, disappearing down the hallway. When he was out of sight, Elise started again. “Cats and starrrs!” said Otis. “You’re all so sweet,” said Amy. “Thank you.” She turned back to her sister. Beth took a profound breath. Phew. Presently, a buzzing noise came from the foyer, like the sound of an oversized wasp. Beth looked in the direction of the buzzing. She didn’t see anything, but apparently the funeral director did, because his eyes were wide with terror. He sprinted to the foyer. Almost to the front door, his body buckled. He cowered, emitting an inhuman screech. Is it the sun? mused Beth. Is he being burned by the sun? A helicopter whizzed over the director’s bald head, almost clipping his last few strands of hair. Holy crap! thought Beth. Max chased behind the helicopter, clutching a remote control. He hurdled over the funeral director into the parlor. “Mommy, mommy!” he shouted. “Watch what I can do!” He was still wearing his shirt and tie, but was lacking pants. A few feet of toilet paper, caught in the elastic of his Tyrannosaurus Rex undies, streamed festively behind him. “THE HELICOPTER IS GONNA FIGHT THE DRAGONS!” he announced. Amy sprung from her chair to give chase, the helicopter dipping and weaving any time Max lost concentration to evade her. Elderly folks pushed the limits of their bodies to dodge the helicopter’s tiny spinning blades. In the foyer, Amy took a corner too sharply, letting out a pained yelp as she lurched head-first into the snack table, sending the mostly-uneaten bowl of chopped liver crashing to the floor. His mother down, Max was able to re-focus. “No I’m not, dum-dum!” said Max. “Mommy, watch this!” He stuck out his tongue in concentration. The helicopter whirled violently in the air – once, twice, three times. Finally, it steadied, lowering gracefully down to rest on top of the coffin. “MAX HOLLIS MORAN!” bellowed Amy from the foyer. She rolled helplessly on the floor, a square of toilet paper clutched in her hand. “MOMMY!” howled Max, noticing the toilet paper dangling from his backside. “I HAVE A TAIL!” He did a little jig in front of the coffin, shimmying his hips back and forth as the toilet paper tail darted to-and-fro. Elise pumped her shoulders up and down, ‘raising the roof’ with her good arm. “Go Otis! Go Otis!” she chanted. She doubled over, a look of pained elation on her face as she guffawed. A moment later, a torrent of vomit sprayed from her mouth. The funeral director yelped, bolting over to clean up the mess. He tripped in his haste, executing an unintentional slip-and-slide maneuver across the floor. Oh, the humanity, thought Beth. To her surprise, the service erupted with laughter. Beth scanned the room in shock. Her mother and father were losing it, and the rabbi was holding his hand over his mouth as his chest convulsed. Soon she was laughing, too, clutching her belly. Tears streamed down everybody’s faces. Inside the modest brown coffin, below an expertly-landed toy helicopter, Gertie lay smiling, the pleasant smile of a peaceful passing, but wider now, with more depth. What a ball it was to have everyone together like this! She giggled, but wasn’t sure if anyone could hear her. Presently, Gertie felt herself drifting. Gently, ever so gently, up and out of the room. Clearing the rooftop, she delighted in a benevolent silver sky, where three dragons — one purple, one pink, and one blue — greeted her with kind eyes, taking her softly on her way.